I’ve read good amount of books/ blogs/ reddit threads on productivity. Mainly, I was inspired to work on improving my productivity after reading the book – 4 Hour Work Week. It has been almost a year now practicing & improving my Productivity and today, I want to share with you some of the best ways (or say my experiments) that can dramatically improve your productivity! Note: I’ll be sharing the tips in parts (i.e. one tip every week). Reason: So that you can consume all the tips well! These are ACT Exercises and hence won’t be good if I share all at once! Time for the Second Strategy/ Way to Remain Super Productive! It is just what I wanted as a replacement to a regular TO DO List. 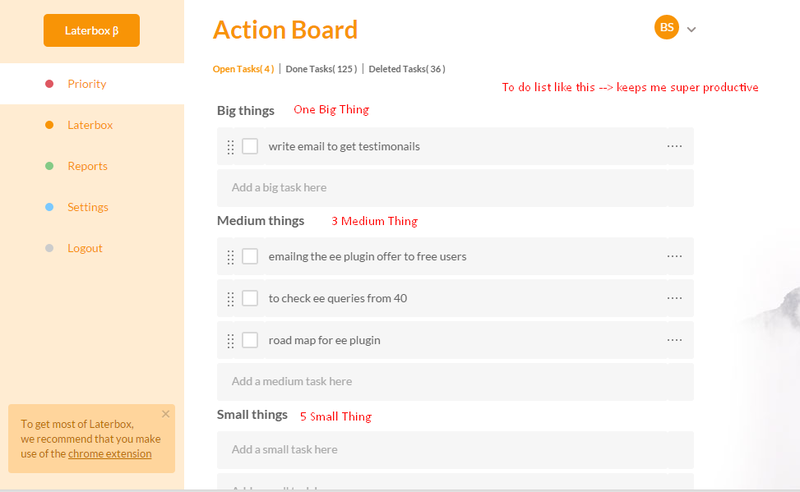 Writing down your task in laterbox, gives you super clarity as to what work you should do first. But then as the day progress we should shift our focus to the Key Task – #1 Highly Important task. 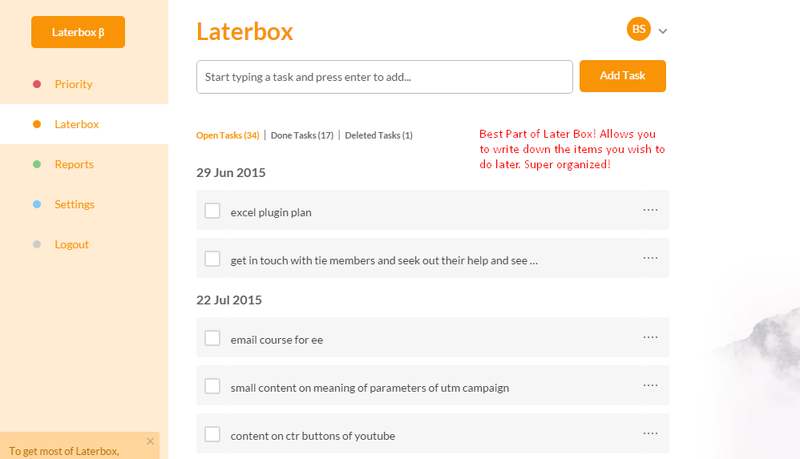 Laterbox reminds me that and helps me complete the most important task! Additionally, it also allows you to add any task you wish to complete later. This helps you not to forget a task which is not important right now but may be in the future. It’s a super awesome feature. Every week, when I am making my report, I open up later box and see the activities I wanted to do. And then add them in the current weeks plan! Highly recommend the tool –> For super awesome clarity of work on day to day basis.